Graduation across Indian country is an exciting time! We all come together to celebrate the achievements of our friends and family. Most of these graduates have had to sacrifice precious time with family, many have had to move away from their home communities in pursuit of higher education, but all are on important missions that (in my eyes) help our communities to move towards greater self-governance. 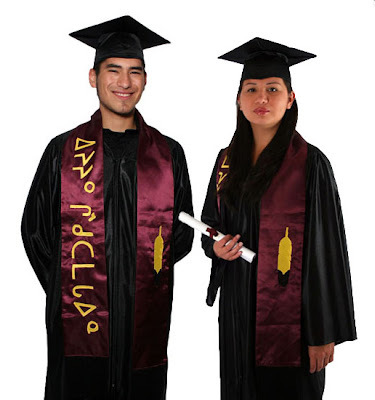 If you will be graduating this spring, please consider wearing your tribe's regalia or otherwise wearing your identity on your cap and gown. It is so incredibly important for others to see Native people succeeding in academia. And it is incredibly important that 'diversity' is visualized during the graduation ceremony. It is necessary for children, adults, and grandparents of all backgrounds to see Native people achieving and doing positive things. Pictured above is Tammy Beauvais' Graduation Stole. From the Mohawk Nation, Beauvais creates custom graduation stoles with colors and designs from your nation or tribe. Click here for more information.